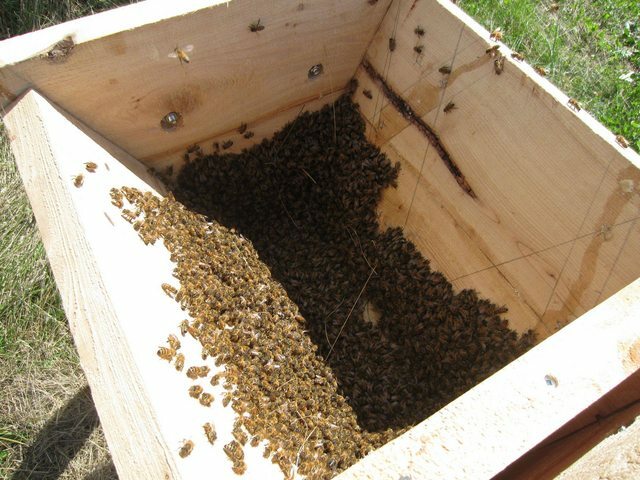 Hey folks, I finally have seen some Honeybees in my gardens and I'm interested in locating their hive. Last night there were 3 Bees at any one time, collecting water from my head lettuce. They were easy to spot since I'm in the gardens daily and hadn't seen a single Honeybee up until this week! They were all taking their time, buzzing from one leaf puddle to the next, then each flying off over the hedge and towards the neighbors house. The catch is the house is unoccupied, it's been up for sale for almost a year and hasn't had anyone living on the property. I suspect it is a feral hive, because I know there aren't any apiaries near by, and I can't imagine the Bees are flying very far to get to my water source. We have had loads of rain and there should be puddles everywhere! This afternoon there was only a single Bee harvesting water, so I timed her return trip and tried to see which direction she went. Twice she left my lettuce and returned in 2:45 exactly! She went directly towards the neighbors buildings (they have a house, large shed, and very large indoor horse ring, as well as several large trees). I was hoping to get some tips on how to locate her hive. I'd like to try setting some bait out on another angle to triangulate the location to start looking. Would you folks say this is a feral hive living near by? 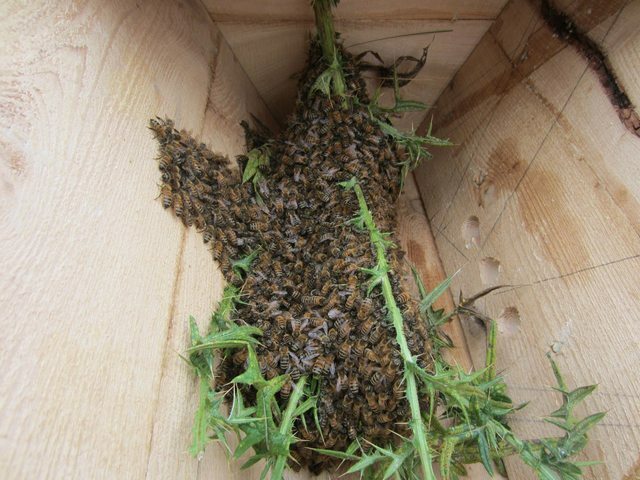 Could a swarm have taken up residence recently? 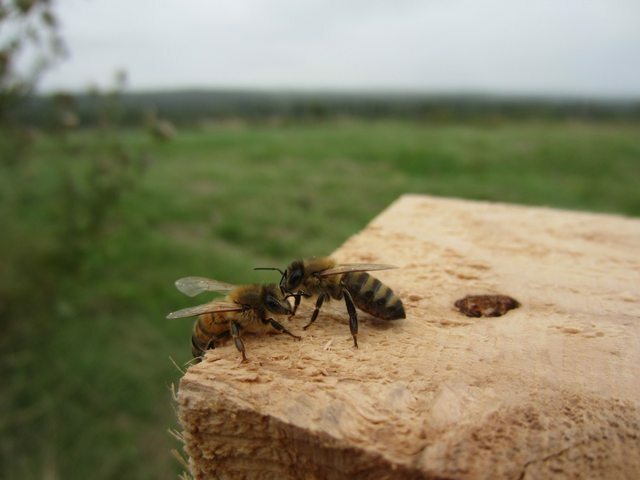 I'm curious why I haven't seen this behavior or any Honeybees until just the last few days. Any insight my Bee loving friends? Dust her with powdered sugar so she's easier to track. Or set out a little honey for bait and dust multiple. I calculated the approximate distance using the 2:45 return trip time with 25 km/h and the hive was almost dead on. I hadn't seen any activity in almost a week but today all of a sudden they had found the bird bath and were harvesting water like crazy! 20 Bees at one time was the most I saw, but mostly groups of 8-10 were making return trips the entire day. I tried dusting them with icing sugar but they would just sit and wipe it all off before leaving ha! So I just did a more thorough search in my target area and voila! Couldn't miss it this time, not sure if the colony was a lot smaller last week but the sound and swarming was easy to spot today. 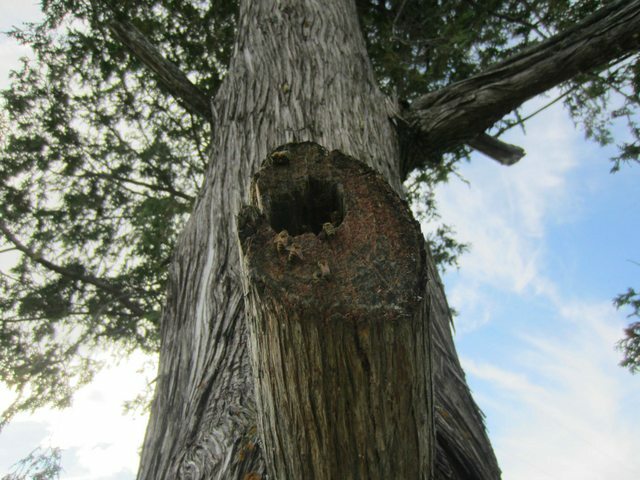 The hive is inside a nice size cedar(I think) and is located near ground level. At first I only noticed the main entry way, a sawed off branch that is now hollowed out. After a few minutes of observation I noticed another smaller hole in a side trunk that also had Bees coming and going, only much less busy. What I thought might be a nice size colony may in fact be a very large colony! The space between both entrances is massive, and the tree has about a 3 foot diameter at the base! Any guesses as to how large a colony this may be? The house is VERY close (10 meters) from the tree, so when the house is sold and new residents move in it almost certainly will be removed for safety. Score 1 for my beekeeping endeavors! 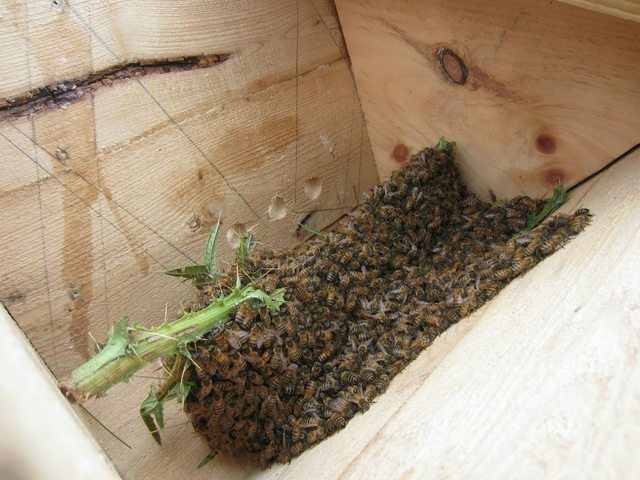 Has anyone had any experience removing a hive from a live tree and transferring to a TBH? Could I set up my first TBH next to the tree and bait them to take residence? 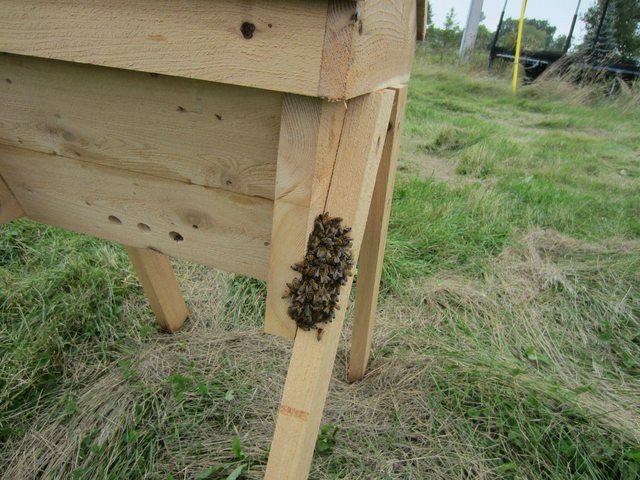 Exciting times, this is the first time I've observed Honeybees, and the first hive I've ever seen, wild or otherwise! Apologies for the massive images, still trying to figure out how to reduce when embedded. I'm excited to find out what happened next. 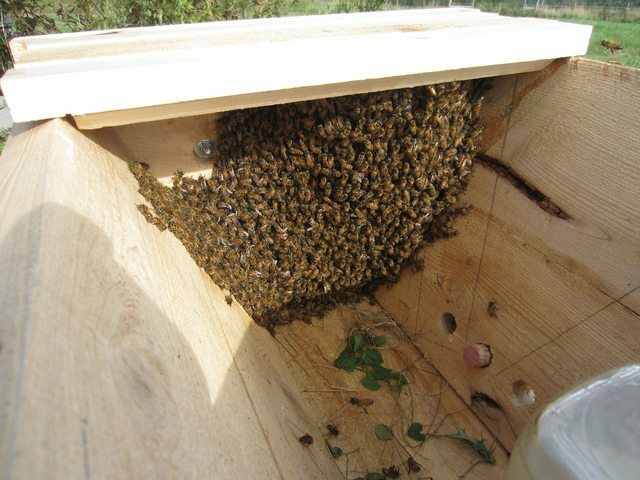 Maybe if you would put a bait hive... but... a standard swarm could be up to 5kg, but this is not really a swarm - they are (as it seams) a fully functioning colony - so... there could be much more. 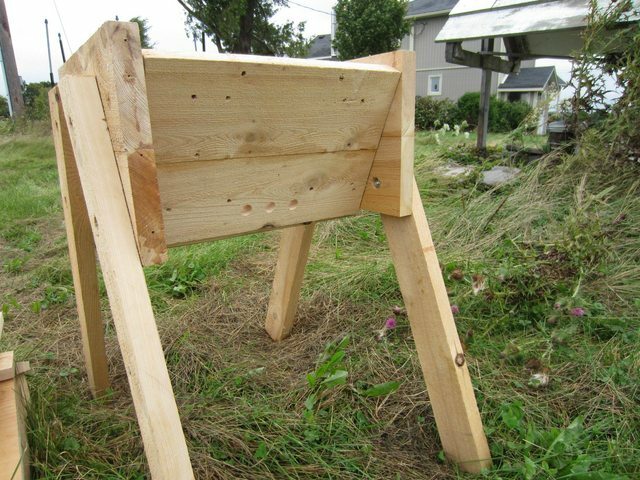 Since bees search for the ideal place for them with a particular volume, I recommend if you could make several bait hives from 40 liters to maybe even few times bigger. Put some lemon grass oil inside on some cotton pads which should attract them. I would suggest not moving them unless/until you really have to. You don't know when the new owners will move in and what their attitude will be and the bees are obviously happy where they are. 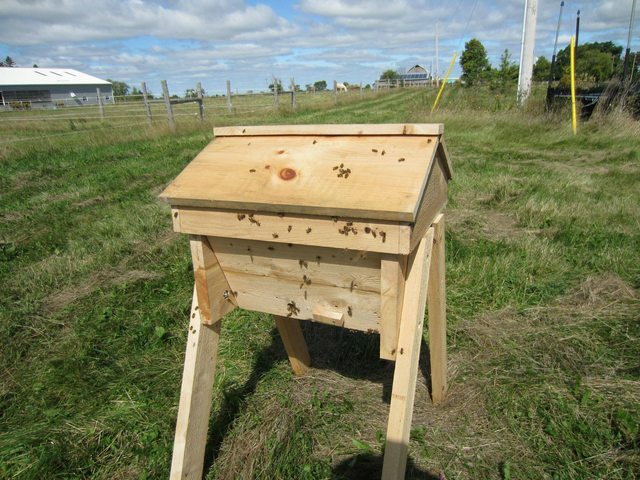 I don't know when the swarming season is in your part of the world but setting up bait hives would be a sensible thing to do at the appropriate time of year. If you do end up having to move them, then you can either do a cut-out, which would probably kill the tree, or a trap-out, which effectively ends the genetic line of the colony. I'm with you Adam, I definitely do not want to see them moved. I would love for it to stay put and to simply catch a swarm when it goes. Perhaps even several over some time! 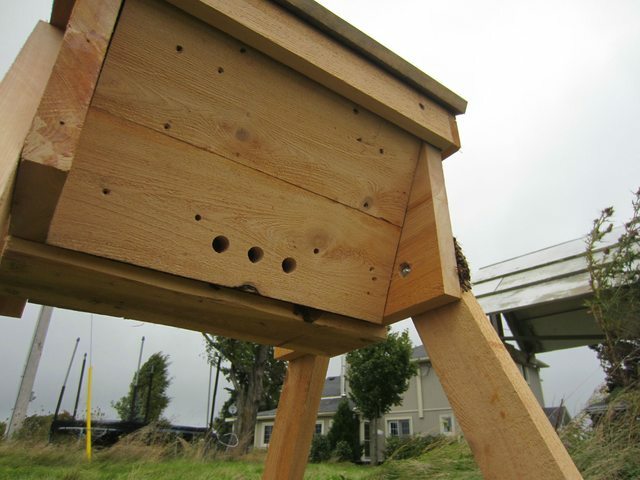 I've dropped a letter off in the mail box and asked the owners to contact me to get permission to observe the hive, and to let them know I'm interested in what happens to the hive if they decide to have it removed. I haven't the tools or know-how to do anything with a tree of Bees so I've asked them to please keep me in the loop. It would be a shame if it has to go, it seems very established and we have a Zone 3-4 winter here. 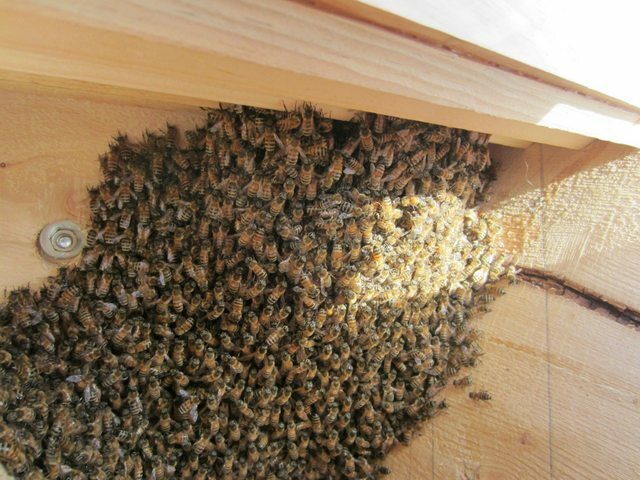 I can't imagine they would do well in a re-home without their already stored honey. 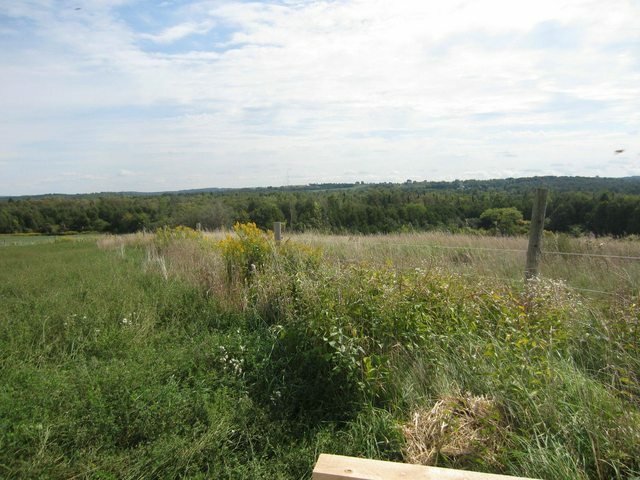 Mostly mono-crop around here and not much for food sources come fall. I just received notification that this colony has swarmed and is located on a wishing well about 20 feet away almost at ground level! 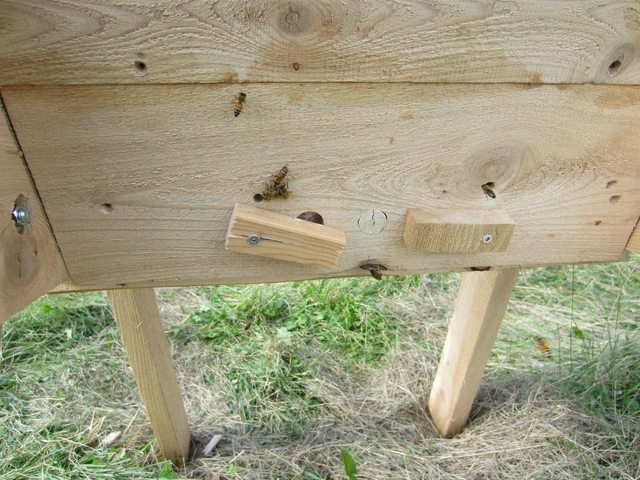 I've been slow to get my bait hive ready, I made a few mistakes gluing boards and ended up with bad bowing, enough that I have to re-cut and re-glue my boards to complete my hive. I wasn't expecting a fall swarm, but here it is! This is the second swarm of this year, how big of a colony is in this tree?? What would make them swarm this late in the season? I know it's thriving, is it just too large a colony to stay in one location over winter? I'm wondering how long I might have before the swarm takes off and settles. I'm going to do everything I can to complete my hive in the next 24 hours and catch the swarm, but I don't even have a bee-suit. Can I use lemon grass to bait them in to my TBH instead of catching and placing? 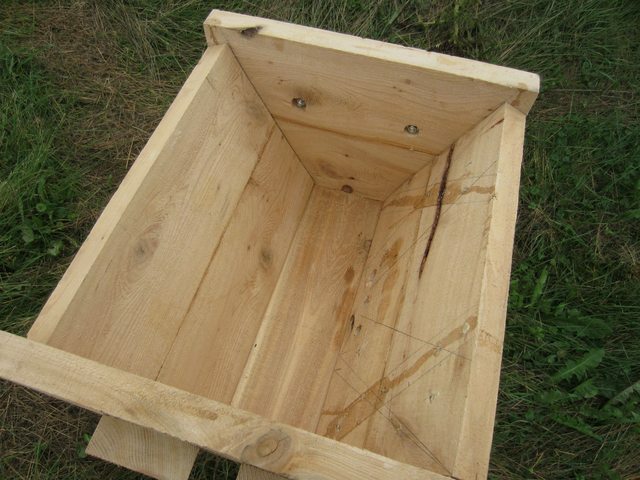 Not having a bait hive ready isn't a problem, Instead of a proper hive, a bucket or box will do. 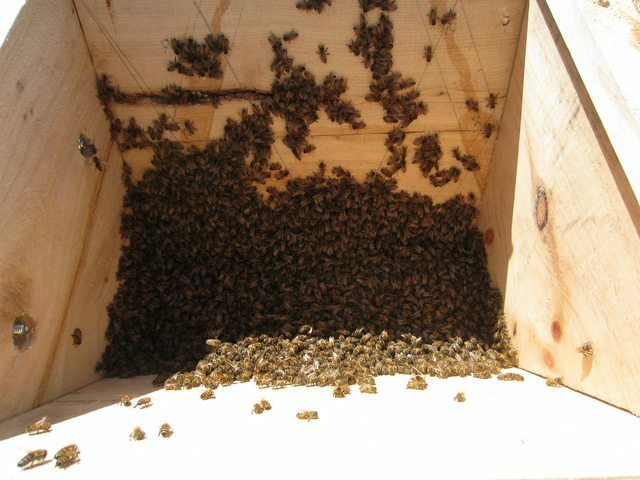 If they are on a branch you just shake them into the box/bucket and then turn the box/bucket upside own, propping up the container with a stick or something to allow the bees to get in and out. 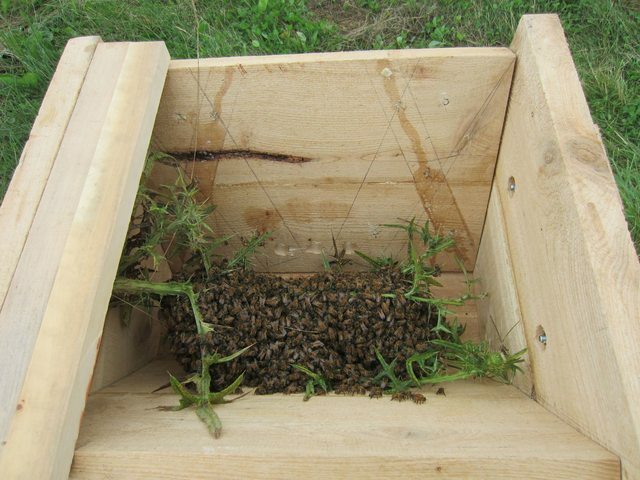 All you have to do is get the queen into the container and the rest of the bees will follow. Don't turn it upside down until you are sure the queen is inside. 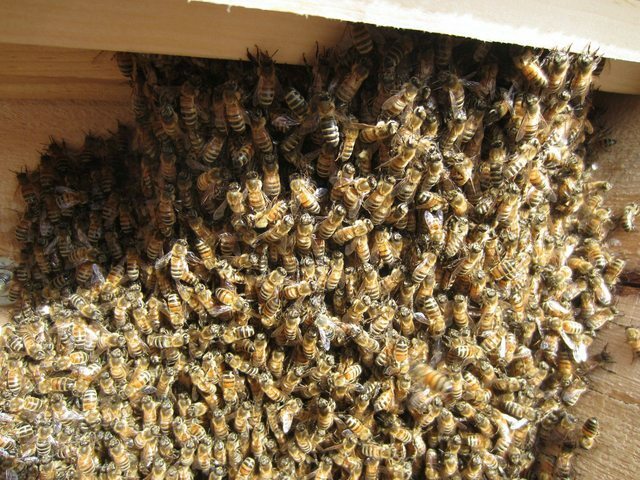 You can tell because there will be lots of fanning and the number of bees in the container will be gradually increasing. Or instead of turning upside down, just cover it with something, ideally top bars. Do you have a hat and some kind of see-through netting available ? If so, you can improvise a bee suit with some thick clothes, a wide brimmed hat and the netting over your face and neck, tucker into a thick shirt and tied onto the hat. 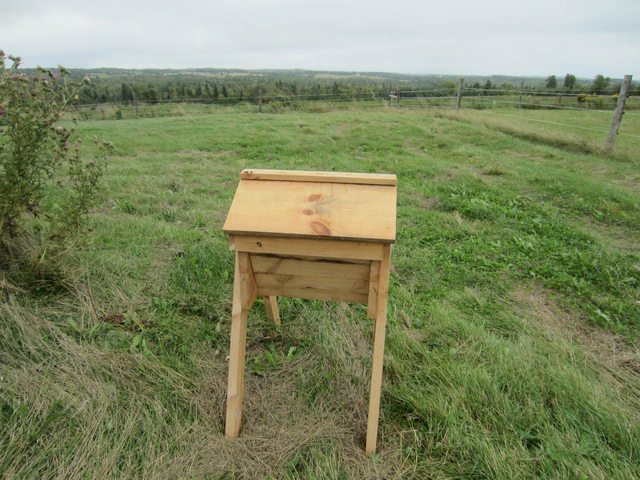 Or maybe just get an experienced beekeeper over asap ! You probably don't have long until they move off somewhere else to something that looks to them like a more permanent home. Then it's a case of "follow those bees" ! What is the weather like there now ? Are there a lot of flowering plants around now ? Do you have a lot of flowering plants in the next couple of months ? One more thing : if they're on a well, you might be able to simply sweep them in to your container. If you have say, a gortex coat and skiing gloves you might be able to do it with no specialised gear, just with your hand or maybe a piece of smooth cloth or a fine brush. Covering your face will be the problem, particularly your eyes. Got any ski goggles ? Balaclavas ? Buffs ? 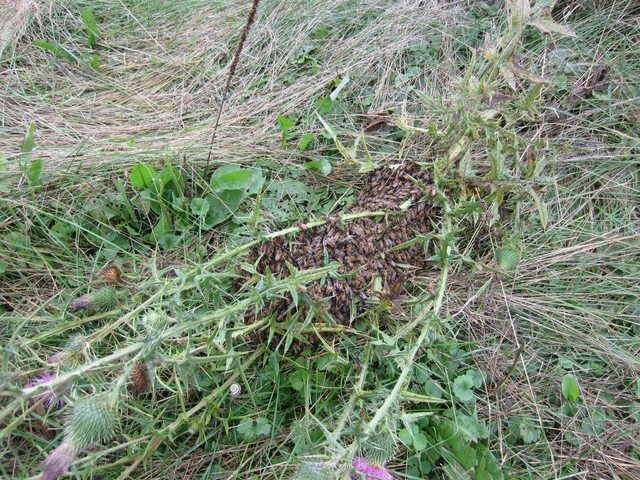 The swarm was actually behind the well, they had attached to a few tall flower stalks and the weight has bent them down to the ground. Looks like a really easy catch, just cut the flowers and pick them up to deposit. 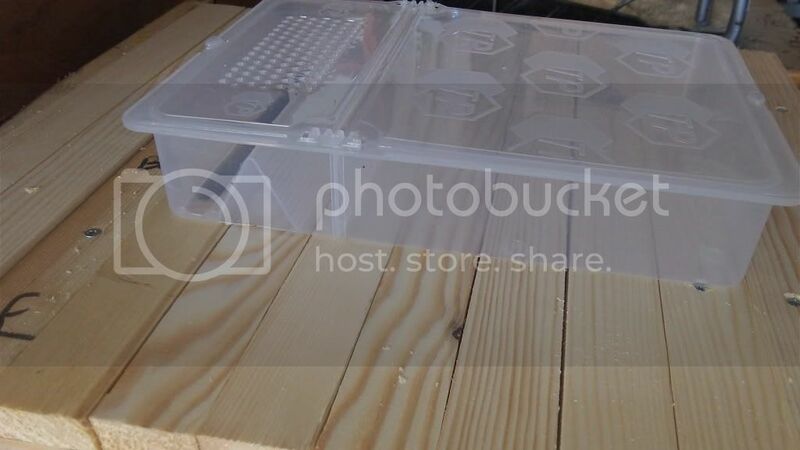 My boards that ended up too warped to use in my full size TBH are perfect for a square hive so I'm halfway through building a bait hive right now, it's 18"x18" and I'll have it on some legs. I'm not sure if I'm brave enough to pick up the swarm without a suit, but I do have ski goggles, a balaclava, a gortex rain jacket and lots of big gloves. I have a mosquito net jacket with hood that I could wear over top of some thick clothes, but it still makes me nervous! How thick of a layer do I need to be protected from stings? How likely are they to attack and go for all the little holes and areas I can't fully seal up? It's going to be night soon, is there less risk if I do this under cover of darkness? It's getting to be cold over night but the days are still in the 20's, and we have loads of wild flowers in bloom right now. Much activity at the main hive in the tree right now! Swarms tend not to be all that aggressive. A reasonable level of covering should be OK. Any covering at all is better than nothing, since then the stingers do not stay in your skin. If you do use Mosquito netting, get it away from the bees as soon as you can, since it will have some unpleasant chemicals in it. I wouldn't use that, but it's up to you. Maybe soak it in water or something to get the chemicals off it, although I have no idea if that makes any difference. Try and put a white sheet on the ground all around where you will be working. It makes it easier to see where they've gone if they fall on the floor. I know this is difficult if you've never done it before, but you need a reasonable level of calm assertiveness. Approach slowly and carefully, place your hands wherever they need to go to get a good grip. But then when you're ready to shake the stem or sweep them in, do it quite firmly. Did you ever get into yo-yo'ing ? It's quite like the flick you need to do that well, down and up in one fast movement. Imagine a yo-yo the weight of a base ball, if that helps. You need to maximize the change in direction of the thing they are currently attached to in order to shake them off it. Having said that, another method might be to simply cut through the stem of whatever they are currently on and gently move the leaf or whatever they are on into your container. 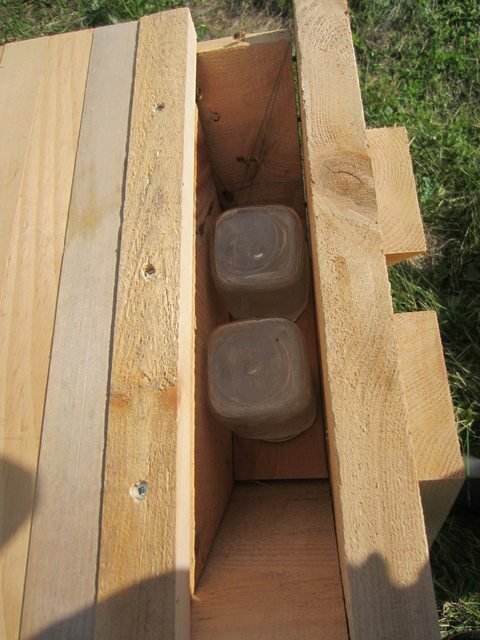 If the leaf is on the bottom of the container the bees will move to the top of the container and you can take the leaf out later - or leave them to chew through it. But bear in mind that if the plant is already bent over then any movement might mean they fall off anyway ( hence the sheet described above ). If it's evening they are unlikely to move now. They might move tomorrow at whatever time of day there is most nectar about. In Northern England, that's between 11am and 2pm, but if it gets really hot in the middle of the day where you are, maybe it's some other time of day. But really, you never know, so I would say the sooner the better. If you don't do it tonight, then quite early tomorrow. I have never done any beekeeping in darkness ! I think for your benefit it might be best to wait until the morning, although I do know that some people harvest at night with red lights ( which the bees cannot see ). Do you have some pictures of your feeding system to help James ( jcfougere ) ? The stars are aligned for me this day! 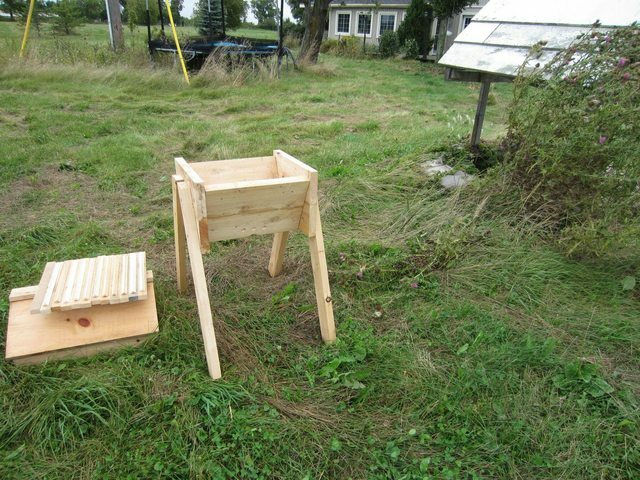 I stayed up late and completed a hive, the same "small hive" in Phil's "How to.." book. 18"x18" following his design. It's bigger than a nuc box and of course just less than half the normal length of his TBH design. Came together nicely, had to use lots of odds and ends to get it right, but I'm happy with the result. I don't have any shellac or propolis to treat the interior, nor the time to apply it, but I did happen to have a bar of wax so I rubbed the interior down to help the Bees out. I also applied some lemongrass essential oil inside and around the entrance to make their new home more alluring. 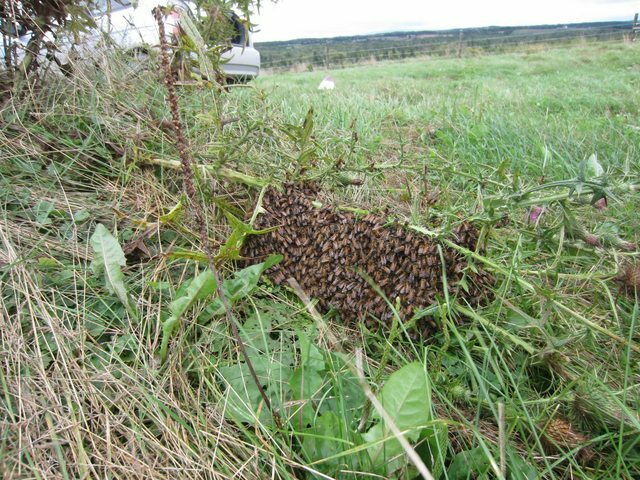 I set out at 7am this morning to check on the swarm, it's still there and so are all the scouts. 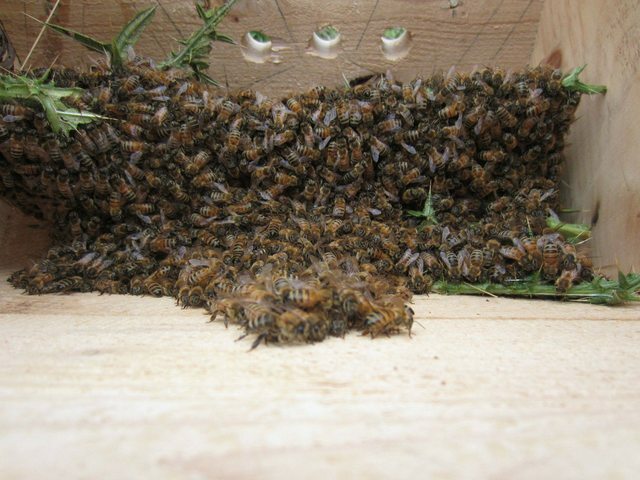 It's a rainy, misty and windy day, and all the Bees are clumped up and together. I don't see any activity at all and they're all soaked. I feel like this is a great opportunity to get 'em! 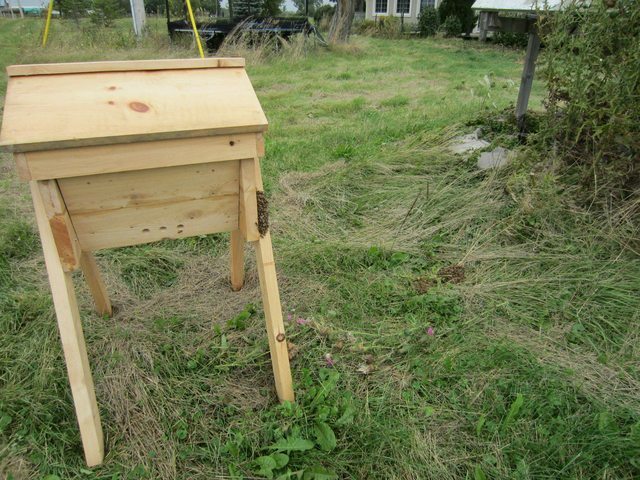 I have the luxury of not needing to move the hive after getting them, so I'm going to get them in my TBH, close them up, and let them stay a while until I find a good place to move them to overwinter. 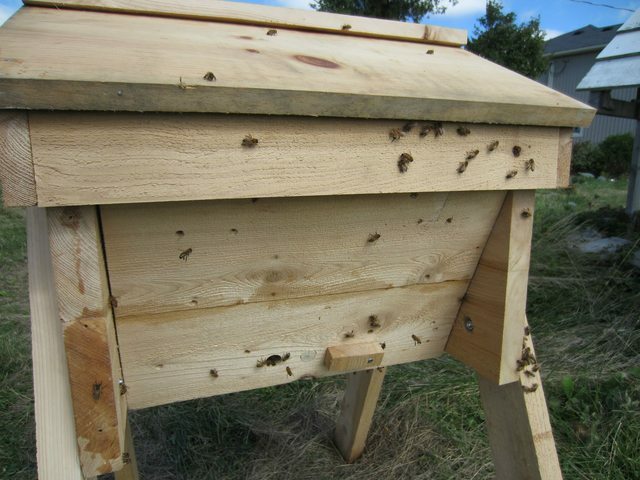 I suppose my only downfall will be if they have already chosen a place they'll just up and leave my hive. Another stroke of luck is my mother-in-law's co-worker keeps Bees and I was able to meet her this morning to get a proper hat and gloves! 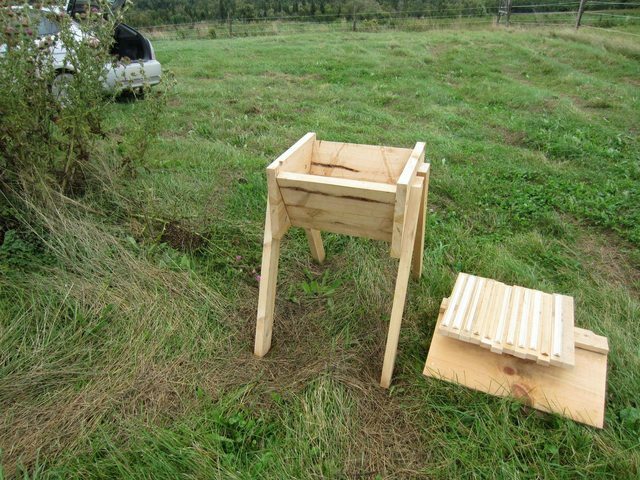 So I've got everything I need to keep the Bees out of my clothes, my hive is set up next to the swarm, and once finished my cup of coffee I'm off to collect my first swarm! I bundled up in what was a mixture of beekeeping gear and snowboarding gear and collected my first swarm! They were very docile, only a few even bothered to check me out. 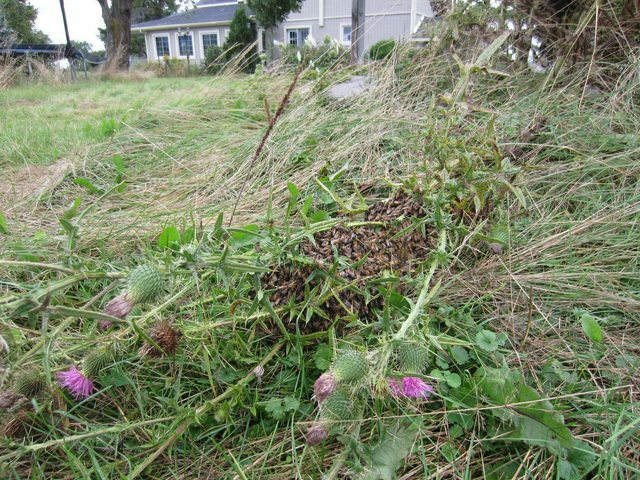 I was able to cut the thistle branch at the base, I trimmed off most of the flowers and lifted it up in one big piece. 90% of the Bees were attached and I simply set 'er down in my TBH. 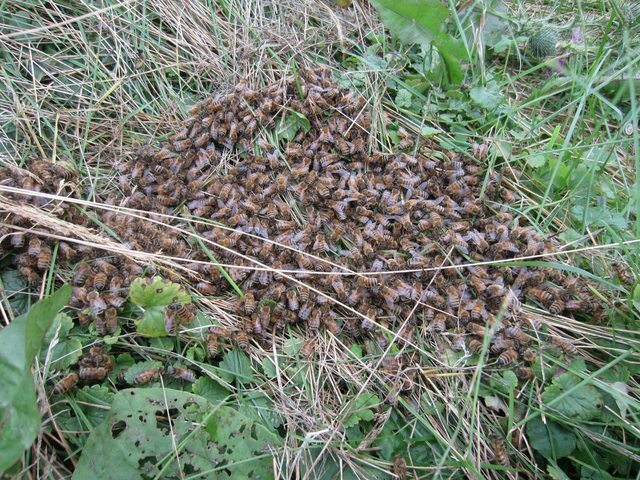 There were several hundred still on the ground, but I expect if I have the queen the rest will eventually follow. I was debating shaking them off the branch but decided to just leave it bee for now(ha!) and go back later to remove it. I did trim the remainder of the flowers and end pieces so there was as little vegetation as possible left behind. I'll find out if this was folly soon enough. 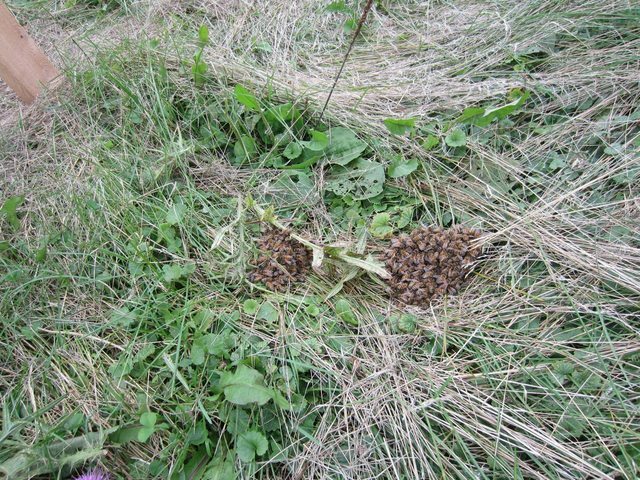 The remaining Bees on the ground had congregated in 2 small bunches, and there is now a mass forming on the side of the hive. 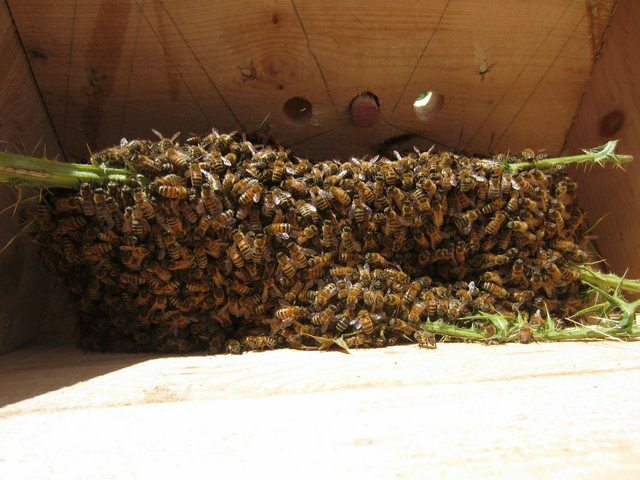 I wasn't able to deduce if the Bees on the outside of the hive had flown up from the ground, or if they are exiting the hive. The wind is so strong that when they take off they are blown out of view! I didn't check inside the hive, but I did observe for about 15 minutes and did not see any Bees enter or leave the hive cavity. 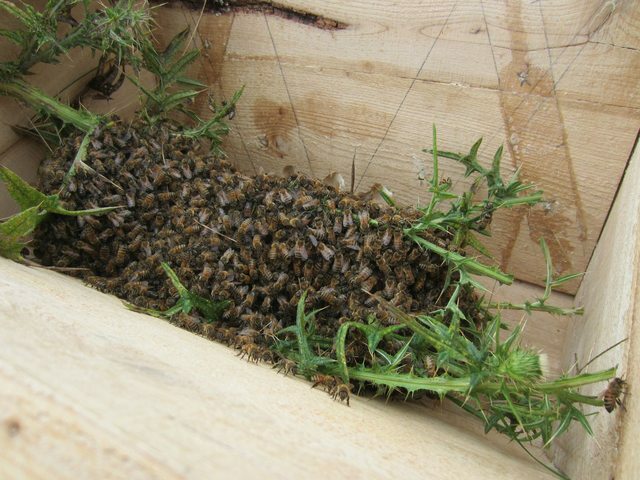 Would high winds keep the queen pheromones from reaching the others right away? 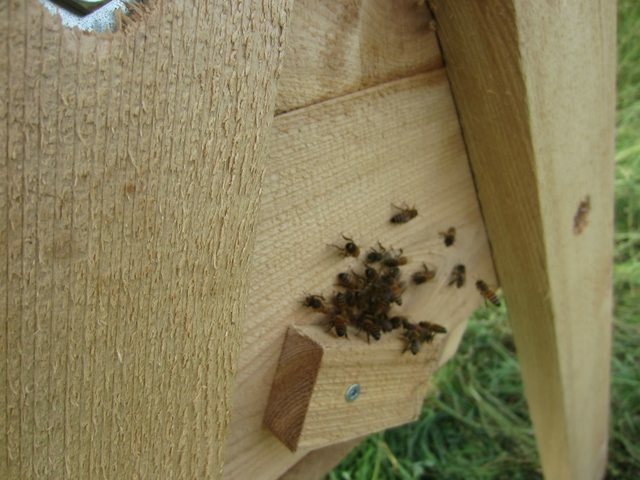 There were several Bees under the hive working away at the small cracks between the bottom board and the walls. I don't know if this is a sign of them taking up residence or just Bees being curious. 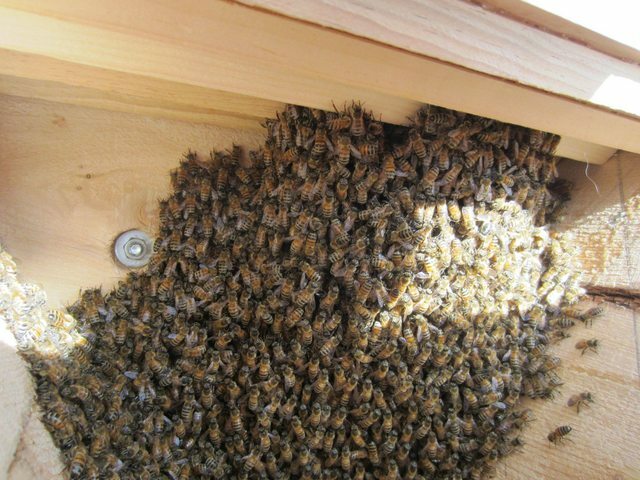 There were also some Bees on the roof doing what looked like eating or tasting the wood fibers. It is rough cut cedar, not sure what they were doing. In another few hours I plan to return with my gear and take a look inside. Hoping I can successfully remove the branch, and also place a follower board to prevent cross comb building. Thanks for your input and suggestions! 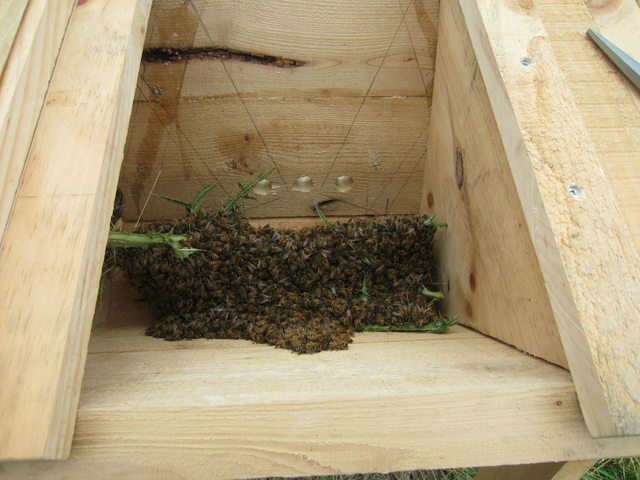 Still 2 small clusters in the grass and 1 cluster on the hive leg, but most are happy in the hive cavity. I'm not sure what the Bees are doing on the wall inside, but it seems like there are more and more spreading out like a blanket on the wall. Are they doing something? Great pictures ! I would also block all but one entrance. 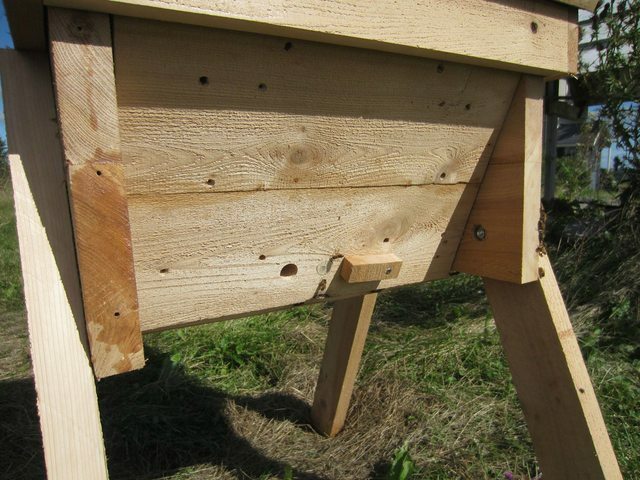 I checked on the hive this morning, and posted in the URGENT forum to get some input. Forecast isn't looking good for the next week and I lost all the Bees that didn't make it in to the hive last night. 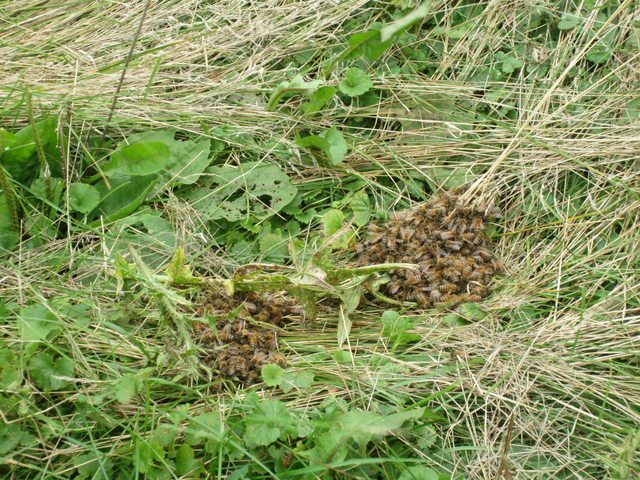 Barbara was right the bees on the ground were revitalized by the time I went back, and there were bees flying in and out of the hive also! It warmed up very nicely in the sun even though the air temperature is low. 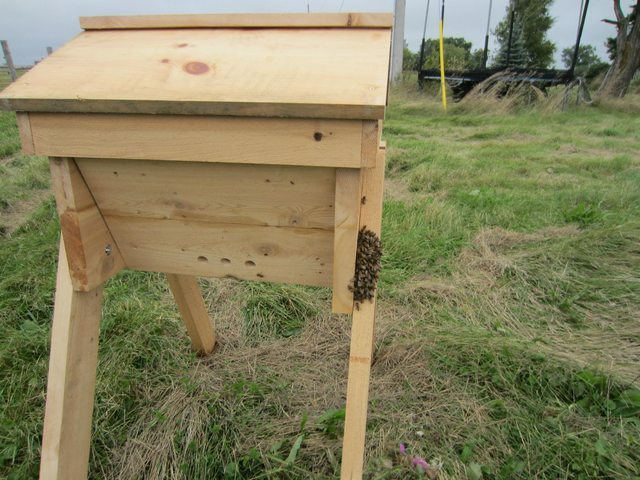 The cluster on the side of the hive was also much smaller and had bees coming and going. It doesn't seem like they need any feeding to get them going, once I shook them off the branch it's as if they all awoke from a stupor. I plugged one entrance with a cork and the other with a piece of wood I can pivot on and off. My second piece of wood kept splitting when I screwed through it but I'll go back later to add another that will allow me to close the remaining hole to a half size. Now I suppose all that is left is to wait and see what happens. 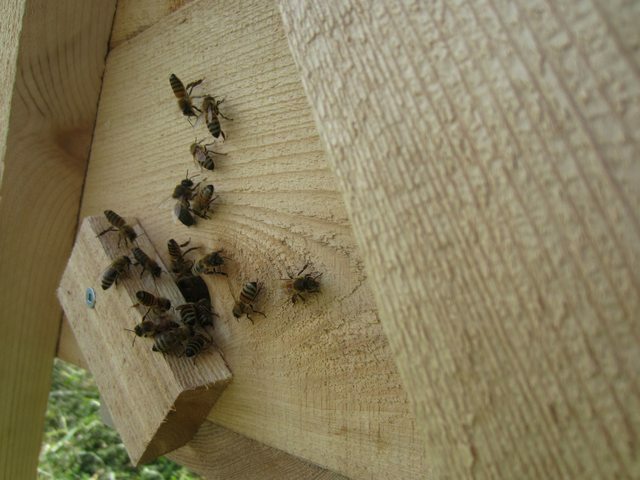 How long should it be before they start to work on building comb and foraging? More good news! Much activity going on at the hive now. 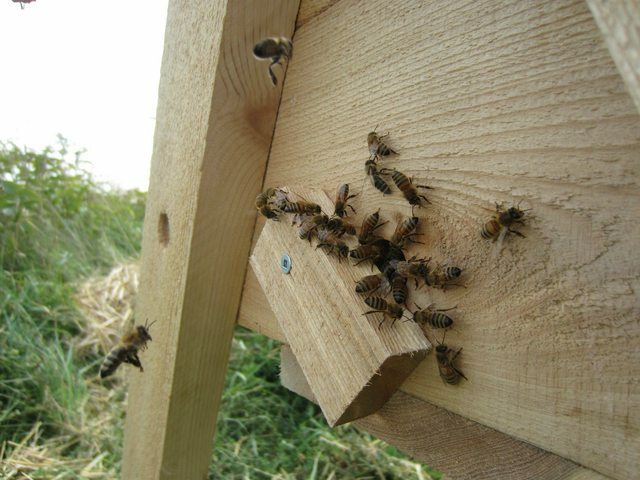 Hundreds coming and going, and all the Bees have moved up to the top bars. I can really appreciate how many Bees there are now that I can see they are about 3 bars thick and almost top to bottom. 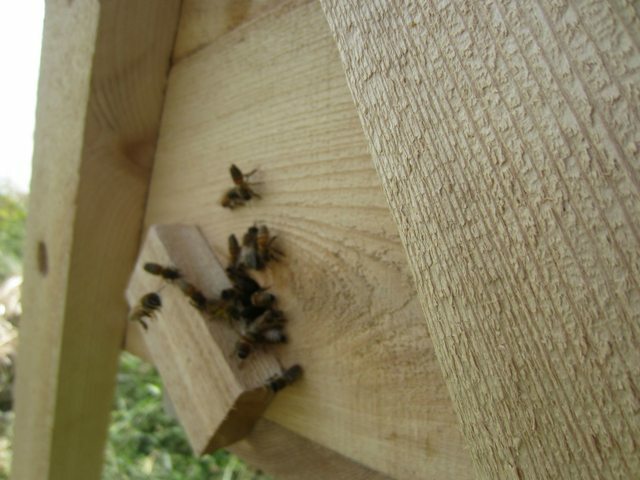 I didn't see any pollen on the Bees arriving, so not sure what they are doing away from the hive. I installed a platform feeder with 2 jars of 1:1 syrup, and drilled a hold in one of my followers. 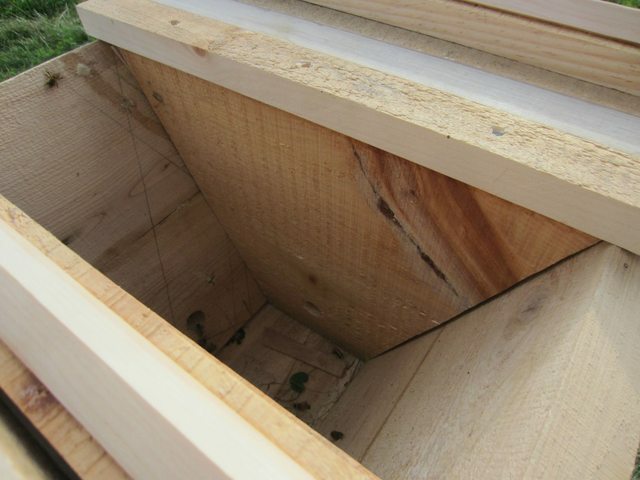 Neither of my followers fit perfect because the hive wood is warped, but I think I read somewhere it matters not, the bees will stay in the main chamber regardless if there are cracks they can get through. This being my first hive I don't know if this is the beginning of comb on the bars, or just more swarming behavior. I am encouraged by the fact there is so much activity now, and I feel better having added a feeder to make sure they have enough energy to build. The other half of the colony is still busy bringing in pollen, hundreds coming and going through the branch entrance of the big cedar tree. I can only imagine the size of the colony, and it's honey, inside..
Good luck and thanks for all the great fotos. I will watch the video later. Things are looking good at the hive today. We had some nice sun and warmer temperatures today up to 17. Lots of activity, workers coming and going, I actually had to open up the entrance to about 3/4 to allow for all the activity! When I arrived there was a queue to enter and leave so this seemed to help them get moving faster. I'll close it down to it's smallest size that still allows a bee to come and go to keep out the cold tonight. I watched the activity for about 15 minutes and saw lots of fanning going on. There were about 5-6 girls fanning at the entrance, as well as several inside the feeding chamber fanning. I saw at least 5 individual drones going in and out of the entrance, and also taking flight around the hive. I watched to see if they were being evicted but it seemed they were leaving on their own accord. In the time I watched the entrance, I did see a girl come back with pollen! She was coated in yellow pollen. It was not tucked into the usual tight packet on her legs, it looked like she dove in to a pollen bath then flew back to the hive. Unfortunately the picture I snapped was out of focus, but you can sort of see the yellow on her in the blurry picture below. The feeders were being used, and as I said above, there were 2 or 3 bees fanning inside the chamber. Not a lot of syrup was gone, I would say about 10-20mL in total has been consumed. I discovered a bee drinking as I lifted out one of the jars to inspect, so I feel satisfied they are getting what they need. I left another 500mL of solution in a sealed mason jar at the hive to top up as needed. 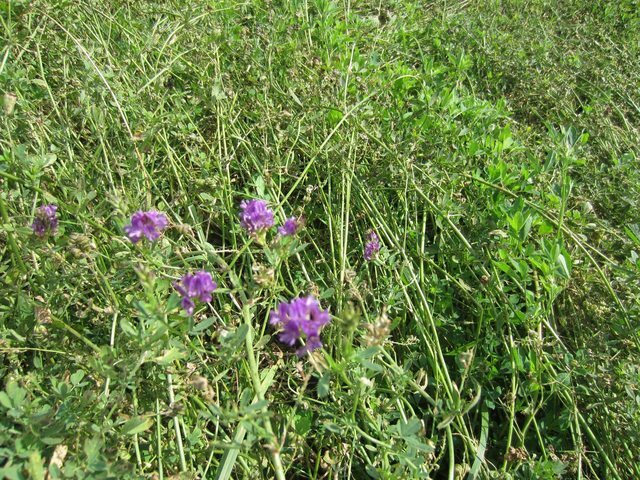 The primary flowers in bloom are rag weed and alfalfa, and they are abundant right now. 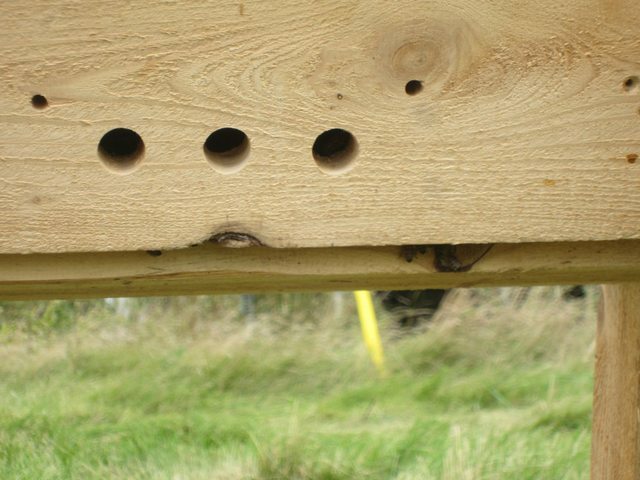 I've moved the hive away from the tree form which it swarmed, added an entrance to the end of the hive where the bees were clustered, and shrunk the cavity down to 4 bars. I'm dying to know, what are the bees doing? Are they foraging? What could they be bringing back to the hive? Would they forage for anything specific during the comb building stage? Nectar? I watched the activity for about 15 minutes and saw lots of fanning going on. The fanning is releasing a hormone to say "the entrance is here". It helps guide the foragers into the hive. 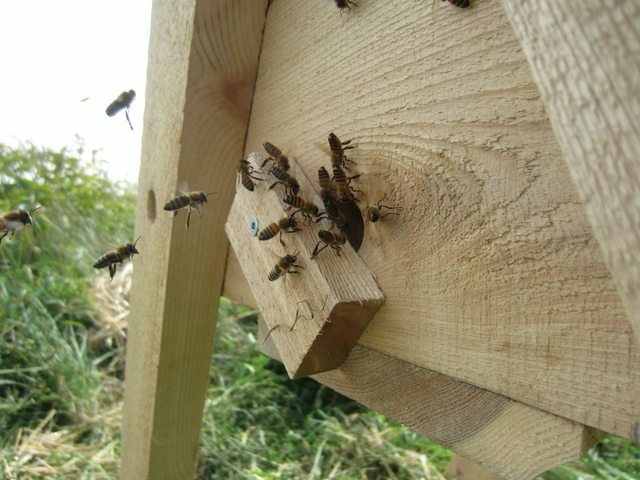 My experience is that on a warm day with a small entrance, they will do this on the outside of the hive, but on a cold day or with a larger entrance they will do this on the inside. In the time I watched the entrance, I did see a girl come back with pollen! She was coated in yellow pollen. It was not tucked into the usual tight packet on her legs, it looked like she dove in to a pollen bath then flew back to the hive. At this time of year, we have something similar in the UK with Himalayan Balsam. This is not deliberate pollen collecting, it's just what happens with particular flowers when they go in to collect the nectar and the structure of the flower means that they get covered in pollen. Your local beeks will probably know which plant is causing this. The feeders were being used, and as I said above, there were 2 or 3 bees fanning inside the chamber. Not a lot of syrup was gone, I would say about 10-20mL in total has been consumed. They prefer nectar from flowers to sugar solution, so this is a good sign, showing that there is a strong flow on. At this time of year in the UK, this is starting to dry up. You will probably find that they take more from the feeder on a cold or wet day. Bees basically forage for two or three things. The two most important things are nectar, from which they make honey, and pollen. The honey is their energy store, and the pollen is their protein source. 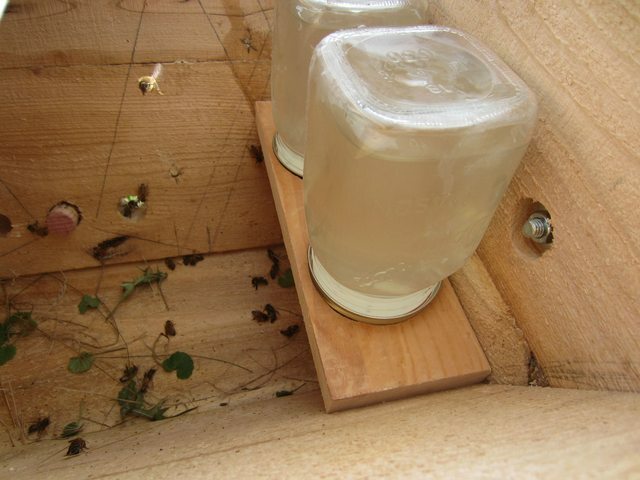 Without the honey, they would run out of energy and not be able to fly or keep the hive at the right temperature. They also use nectar to make wax for the combs ( they extrude it through wax glands ). 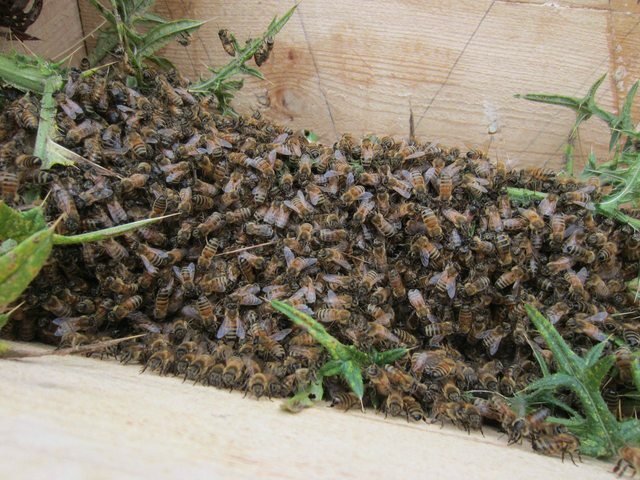 The pollen, after a bit of processing, is mostly used to feed the young bees, which is why we use it as a sign of a laying queen. 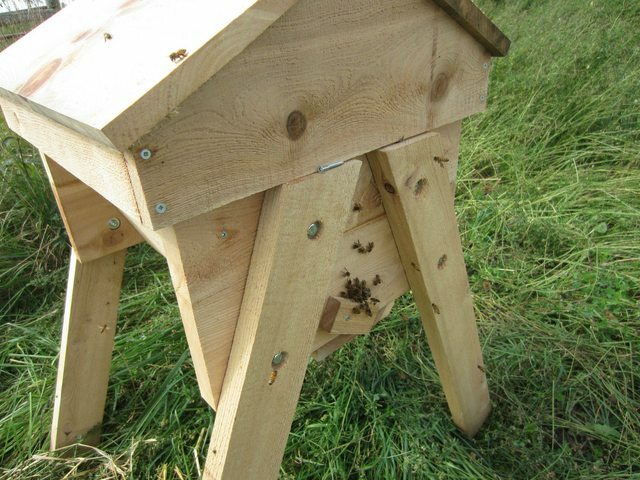 They also bring in propolis, which is somewhere between bee-glue and bee-concrete. They use this to make the hive water and air tight. You will find that they use this to stick the top bars together. It comes directly as sap on leaves and maybe stems rather than from the flowers. 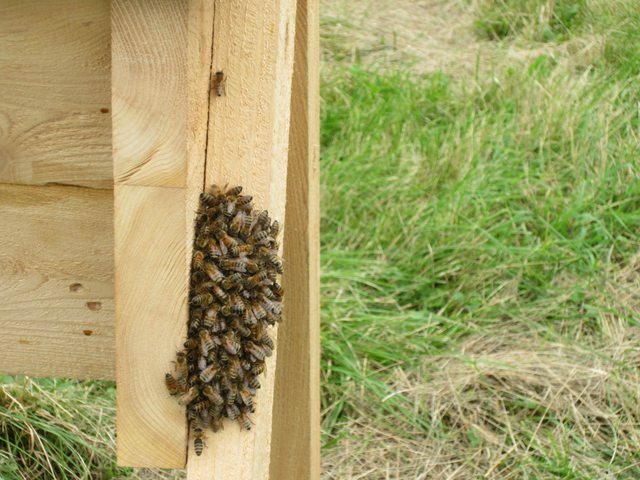 At the moment, your bees will be out collecting nectar from flowers to feed themselves, keep themselves warm, and build comb. 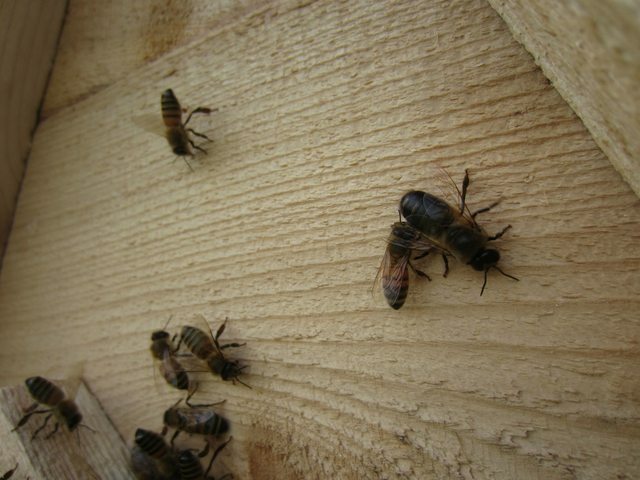 If you have a laying queen, you will also see pollen in the pollen sacs on their legs being brought it for the brood. 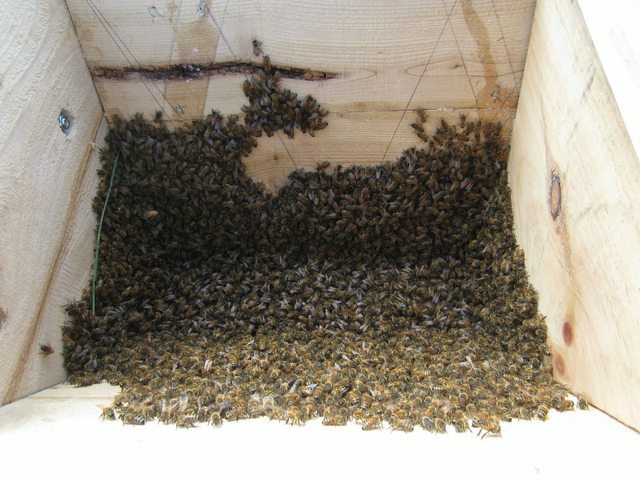 If your swarm was a prime swarm with a mature, fertilized queen, you would expect that to start a few days after the swarm arrives. 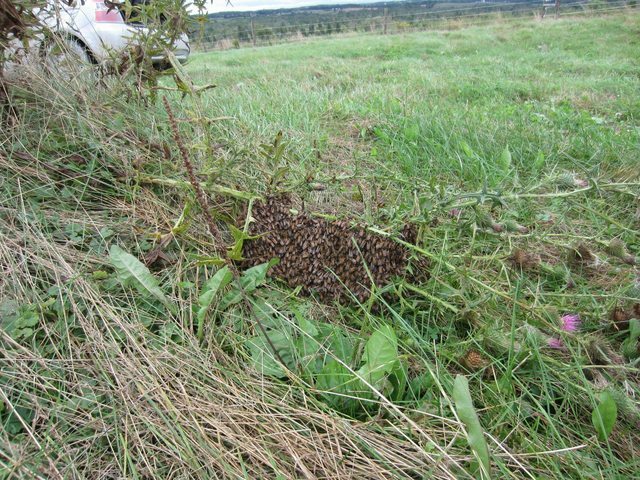 If it is a cast swarm with a virgin queen, the queen has to go out and mate first, which can take a couple of weeks. 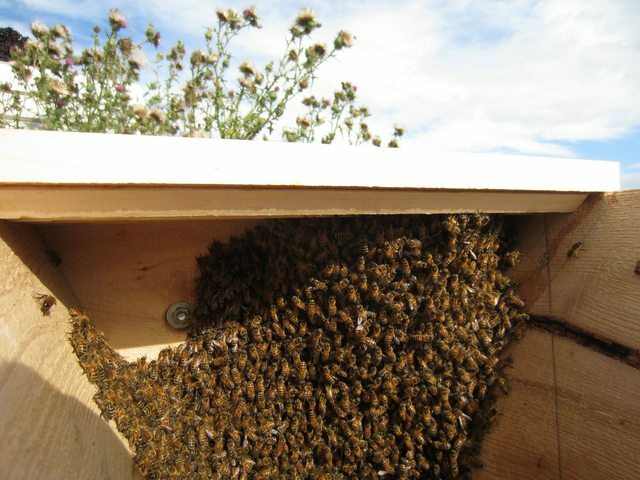 Comb, capped honey, pollen and more! Updates with pictures coming in 4 or 5 hours!! 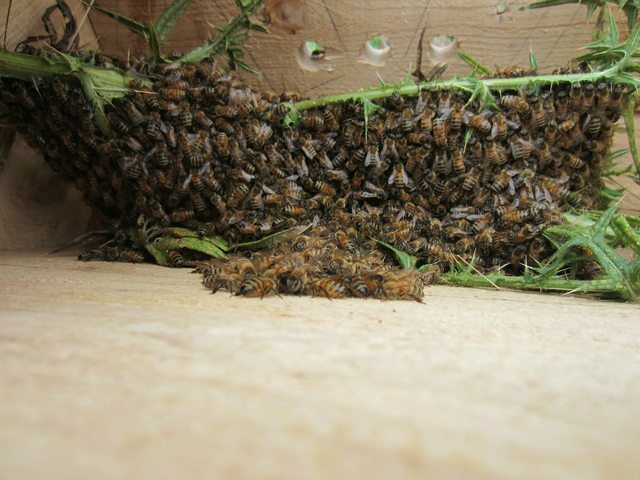 Ladies and Gentlemen we have pollen and 4 bars of built comb!